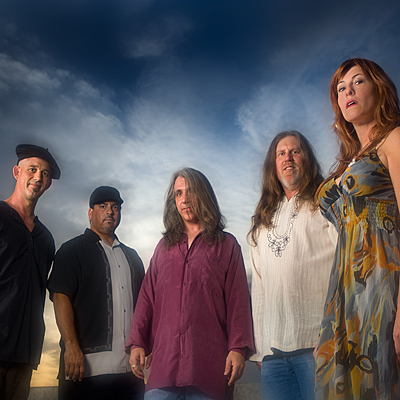 Phoenix, Arizona - October 1, 2009 � Born in the desert, Dream Chemistry sets a new direction for guitarist, Jimmy Caterine (Sacred Rite, Caterine), along with co-musicians/writers- Neal Harris (bass), Michael Mulryan (violin), Ella McGee (vocals), and Tito Valentin (percussion). Formed in 2007 by Jimmy Caterine and Neal Harris, their original concept was to organize and perform at benefit functions and help raise money for several worthwhile causes. They have helped raise money for Eve�s Place (a safe house for women), The Angels on Earth Healing Ministries (volunteer community outreach), the Merritt Center (specializes in programs for soldiers with PTSD) and Homes of Mercy for Children. On this, their debut release, Dream Chemistry blends jazz, progressive rock and country, with Celtic and classical influences to bring you �Organic Jazz.� A great mix of radio friendly songs and musician oriented compositions, Dream Chemistry takes the listener on a spiritual journey. This self titled release contains 11 original tracks plus 2 bonus mixes. The disc includes guest appearances by violinist, Louis Lamp, who also co-wrote the track �Are You Ready� which appears on the CD. Dream Chemistry will be available on October 1, 2009 through Caterine Music/Musical Chemist Publishing, followed by a release at all the obvious places that carry independent music, including CD Baby, Amazon and iTunes. In the short time between its early conception in 2007 and mid 2009, Dream Chemistry has collectively written and composed over 30 compositions. Their engaging live performances have appealed to a very wide audience. It�s not unusual to see three generations enjoying Dream Chemistry in a live setting. Experience is abundant within the group. Jimmy Caterine has numerous album credits to his name. He is most noted as founder, guitarist and co-writer for, 80�s metal quartet, Sacred Rite (Capitol Records.) He has worked with top name professionals, including Grammy Award winning producer Sonny Limbo (Bertie Higgins) and publishing coordinator Randall Wixen (Fleetwood Mac, Jackson Brown.) He gained his theater experience playing with the live stage production of the Rocky Horror Picture Show in 1987 and he was also the guitarist for, MGM recording artist and power house vocalist, Sami Jo Cole (Tell Me a Lie) in 1995. Michael Mulryan (violin) studied under the direction of Hugo Rinaldi and, later, Roy Milan (concertmaster of the San Francisco Ballet Orchestra.) He also attended the Cincinnati Conservatory of Music on a four year scholarship. Ella McGee�s superb lyrics and soaring vocal melodies and Tito Valentin�s rhythmic percussion completes Dream Chemistry�s sound with aural perfection.